ItemI-52021 - "Another view of the garden"; Mrs. H.G. Fisher's garden in July at Summerland, BC showing herbaceous border. ItemI-52024 - Dominion Experimental Farm, Summerland, hay stacks. ItemI-52025 - Keremeos Road with automobile and passenger. ItemI-52017 - "Orchards in bloom at Penticton, Okanagan Valley"; two women in background between fruit trees. ItemI-52050 - "Townsite of Okanagan Falls looking south east from Wair Road". ItemI-52016 - "Air cooler and washer building, no. 3 plant, W.K.P. and L. Company", no. 24; print title. Item I-52025 - Keremeos Road with automobile and passenger. 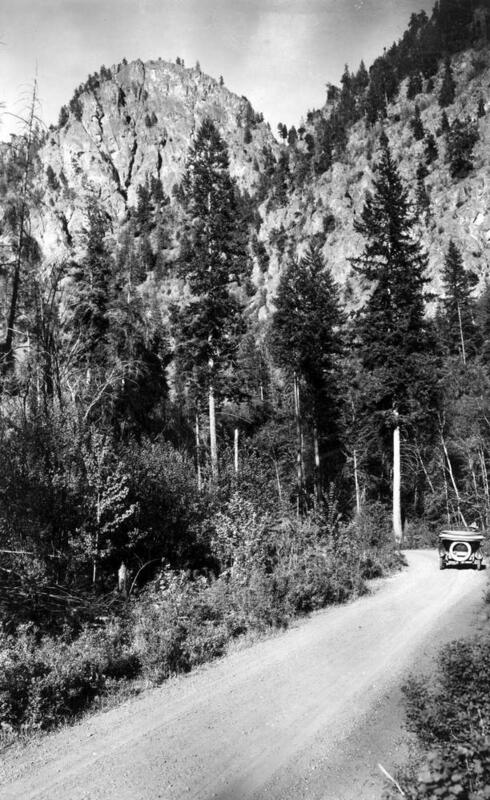 Keremeos Road with automobile and passenger.